By Tim Royner: Anthony Yarde’s manager Tunde Ajayi says he’s going to do all the sparring himself to help Yarde (18-0, 17 KOs) prepare for his upcoming yet to be scheduled title fight against WBO light heavyweight champion Sergey Kovalev (33-3-1, 28 KOs). The two are expected to face each other this summer in Russia, but Ajayi isn’t ruling out the Kovalev-Yarde fight taking place in the UK. If the negotiations fail to produce a fight, then it’ll go to a purse bid, and the Top Rank co-promoted Kovalev will likely get his way with his side winning the bid, and being the ones that decide where the fight will take place. Ajayi says he doesn’t need to hire sparring partners to help Yarde get ready for the Kovalev fight. Ajayi notes that Yarde, 27, has made it this far in his four-year pro career without sparring partners, so he feels that they’re not needed. “We already know this guy gasses out after four rounds. We already know he can’t take body shots,” said Yarde’s manager Tunde Ajayi to the Mayweather Boxing Channel. “We already know he’s been knocked out. We’ve been in with someone with a higher KO percentage [than Kovalev]. Maybe he hasn’t been in with someone at that level, but Anthony is knocking out Kovalev, easy. When we do it, I don’t want to here anyone’s excuses. Everything is about timing, and we’re about to shock the world. On that night, it’s going to be Anthony Yarde and Sergey Kovalev, and he’s getting crushed. It ain’t going on points. We’re knocking the boy [Kovalev] out, you understand? Just like all of our fights go,” Ajayi said. It’s interesting that Ajayi is so confident of Yarde knocking out Kovalev, but it’s common for management to be confident of their fighters. It’s too bad that Yarde doesn’t have more experience going into this fight. He’s been fighting lesser guys his entire career, and now all of a sudden he’s going to be facing one of the best fighters in the 175 lb weight division in 35-year-old Kovalev. 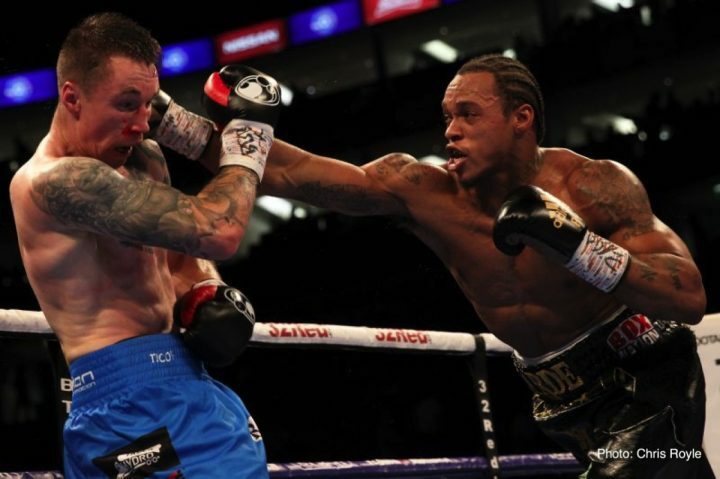 Looking for a knockout is obviously the way to go for Yarde in this fight. He’s unlikely going to outbox Kovalev. That’s not realistic, but he might be able to knock him out if he can push a fast enough pace to wear him down the way that Andre Ward did in his two fights with him. “I’m his best sparring partner,” Ajayi said about Yarde in revealing that he doesn’t plan on hiring any sparring partners to help him prepare for the Kovalev fight. “There’s no such thing as a bad student; only bad teachers. If Anthony Yarde can deflect my shots, then there’s nobody that can touch him. So why should I bring in [sparring partners?]. We’ve got this far not sparring with no guys. So why all of a sudden am I going to start changing our preparation? We’ve never had no [sparring partners]. I ain’t changing our preparation and what he’s been doing to get us to this point. I ain’t bringing in no sparring partners, and the Sunday after the fight, we’re going to show you again that we were right. There’s no wishing. We’re knocking that boy out,” Ajayi said about Yarde knocking out Kovalev. Ajayi might be making a big mistake by not using real sparring partners to help Yarde get ready for the Kovalev fight. It’s nice that Ajayi is willing to spar with Yarde, as you normally don’t see managers sparring with professional fighters. But doing this fight on the cheap by saving money on hiring sparring partners might not be the smartest thing to do. Ajayi might be decent at sparring, but there’s no replacement for having the real thing in there helping Yarde get ready for the tough task of fighting Kovalev. What Yarde needs are guys fro Eastern Europe that can help him prepare for Kovalev’s style. Ajayi isn’t from Eastern Europe, so he’s not going to be able to fight with that kind of a style. He can try and mimic the style of the Eastern European fighters, but unless you’ve been using that style from an early point, it’s not going to be the same thing as what Yarde will be dealing with when he gets inside the ring with Kovalev. Yarde is going to be out of his level if he goes into a title fight against Kovalev with just the sparring help that he’s gotten from his manager Ajayi. “Andre Ward can’t punch like Anthony Yarde. Andre Ward does not have the skill-set of Anthony Yarde,” Ajayi said. It’s true that Yarde is a better puncher than Andre Ward, but the difference in skills between the two is too wide to compare them. Ward is an Olympic gold medalist. Yarde is pretty much having his amateur right now as a pro, and he’s not been facing the kind of high level opposition that Ward fought when he was fighting in the amateur ranks. The amateur background Ward had helped him a lot when he moved up in weight to challenge Kovalev for his light heavyweight titles. “It can be in Britain. It’s not about the location. It’s about boxing,” Ajayi said about the location for the Kovalev vs. Yarde fight. “I understand he’s [Kovalev] the champion. I’m going to leave it up to Frank [Warren] to make the announcement where the fights going to be. We can bring Kovalev here [in UK], anywhere. It don’t matter, even Russia. It don’t matter. Anthony can adjust to anyone. I’ve never see Anthony get out of second gear, and there’s a reason for that,” Ajayi said. It would be very surprising if the Kovalev vs. Yarde fight winds up in the UK. The location for the fight will come down to the negotiations. If it goes to a purse bid, the Top Rank co-promoted Kovalev will likely get his way with the fight taking place in Russia. But if Yarde as good as Ajayi believes him to be, it won’t matter where the fight takes place. He’ll beat Kovalev in front of his own Russian boxing fans. Yarde is certainly catching Kovalev at the right time of his career with him having recently lost twice to Ward and once to Eleider Alvarez. Kovalev looked a lot better in his last fight in beating Alvarez in a rematch. There was a lot of improvement in Kovalev’s game with him boxing more and slugging less. This is a fight where it would be a good idea for Ajayi to break from tradition, and look to hire some quality sparring partners to help Yarde get a little extra from his game. He’s got the youth and the punching power to beat Kovalev. He just needs guys with the Eastern European fighting style to help him prepare for what he’s going to be facing when he gets inside the ring with Sergey.